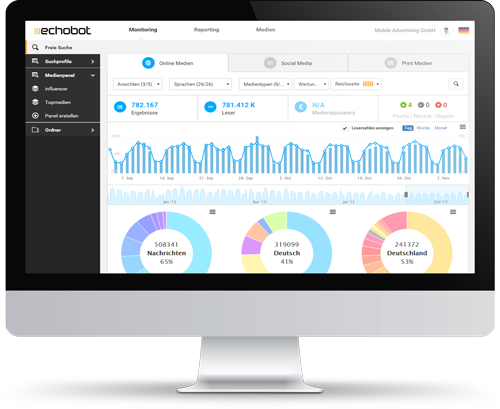 Echobot offers real-time media monitoring powered by high class German engineering. Keep up with posts about your company, your brands, products and competitors. Our unique flat rate pricing model offers maximum flexibility at a fair and predictable investment. Create email alerts, PDF reports, discover influencers or manage a crisis. Echobot offers mission critical insights for your business. 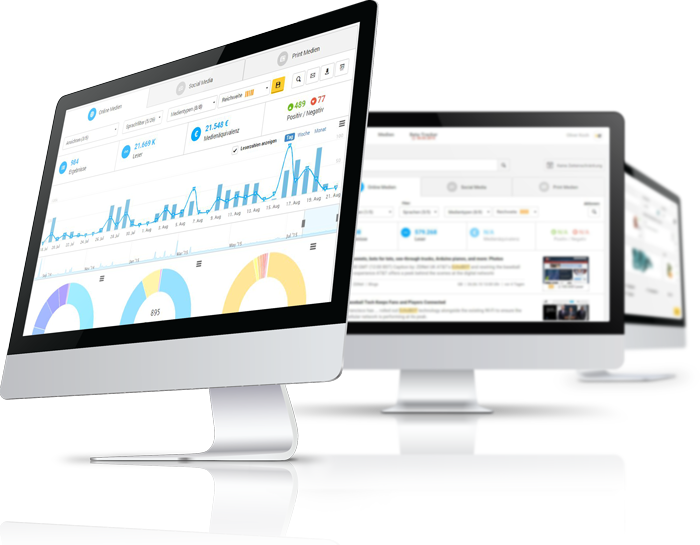 Real-time monitoring of more than 58,000 news portals, feeds, trade magazines as well as news outlets for new articles or reports. 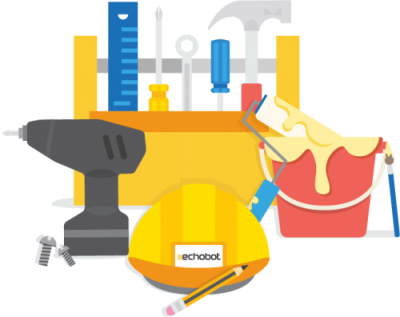 Every day Echobot indexes and analyzes over 20 million public posts, comments, and opinions from Facebook, Twitter, Google+, Instagram, Pinterest, and YouTube based on influencers and keywords. 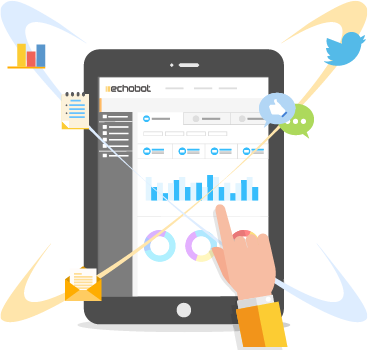 Echobot is constantly crawling and indexing millions of websites, blogs, forums as well as consumer portals and other public pages. To enable effective decision-making in your PR and marketing departments, you need a complete overview of what is being written about your brand, campaigns and competitors. However, keeping track of all topics is often associated with high costs – either due to sophisticated manual research or expensive prices per keyword and clipping. 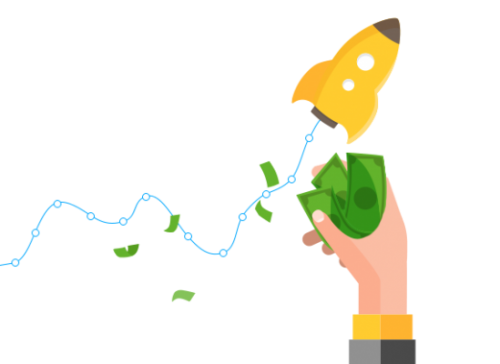 Our unique Echobot flat rate helps you establish automatic, well-structured processes for targeted supply of information to all departments with a fair and predictable investment. It includes unlimited search profiles, unlimited number of results as well as an unlimited number of users and email recipients. Simply contact us to learn more about our pricing. Using Echobot, your team can easily adapt to changing requirements on your own. No more manual change orders or complex, page-wise boolean search queries. Each optimization automatically updates all results, reviews, and analyses in real time. The results are displayed without delay – even dating back to March 2011. Echobot Monitoring can be used on any browser without installation and works on any device that is connected to the Internet. In the new version 2.0, usability has further been optimized for mobile access. Consolidating all the information and clippings for a press review and structuring these to suit your corporate design can be very time consuming. 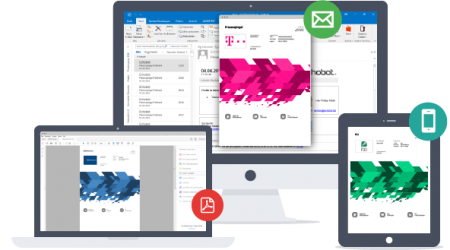 If you wish to escape the copy-paste madness, Echobot has the right solution for you: Combine several profiles in a single report and choose any format for easy processing. Specifically inform individual people or add an entire group of recipients such as departments, partners, or the management. You can easily save your logos, graphics, and colors as a separate template. Creation and sharing are either done at the push of a button, sent automatically at preset times, or generated when needed as a smart warning system. No tool is perfect to guarantee 100% coverage. It is therefore more important for the tool to have smart features that enable you to easily add missing articles and, for example, compare the results with those of commen search engines. The unique cross-check feature, the smart distributor comparison, a simple source extension, and a form where you can add missing items ensure that Echobot delivers exactly that which is needed. Since version 2.0 was launched, Echobot also has different types of search profiles. As a result, you can now link fixed word lists or media panels dynamically using multipurpose profiles, which you can always extend and re-use. The most common application for Echobot Monitoring is the creation of digital press reviews or social media reports. Almost all Echobot users activate the automatic notification option for all important developments, new articles, and opinions via email. The newsroom enables you to integrate found hits in your homepage or intranet. This feature is so popular that we ended up making a separate product from it.